First, a confession. I love LEGO games of this sort. I have purchased every single LEGO movie franchise game on the PS3, as well as all the previous ports to iOS. The fun nature of these games is appealing to almost every age group, and while violence is part of the game, it’s done in a harmless way. Break something, it turns into LEGO pieces. LEGO Star Wars: The Complete Saga is the first LEGO game of this nature, sort of. 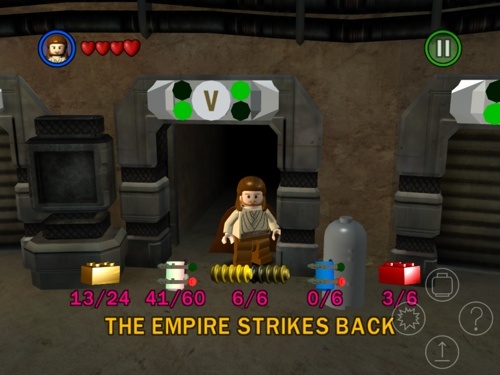 The original game was simply LEGO Star Wars: The Video Game, released back in 2005 for the XBOX and PS2. Developed by TT Games, it was a huge hit, winning many awards. Long time Star War fans were disappointed that the original game only focused on the newer (prequel) movies, and not the adventures of Han Solo, Luke Skywalker, and the last three (original) movies. Still, it was a fun, original game that would set the standard for a decade’s worth of LEGO games that would make millions of dollars. Fans of the original trilogy were given their due in 2006 when TT Games released LEGO Star Wars II: The Original Trilogy. It took the same basic gameplay of the original game, and based it around the settings in those films. Like the first, LEGO Star Wars II would go on to sell many, many copies and win a few awards. 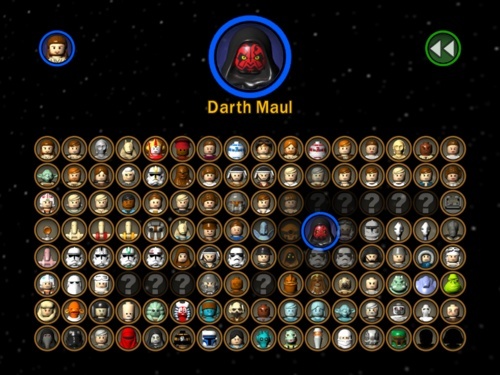 In 2007, both games were combined into one, retiled LEGO Star Wars: The Complete Saga, and released t for the new video game consoles: PS3, XBOX 360, Wii, and eventually a PC, Mac, and now, iOS versions. 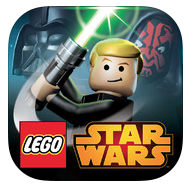 Having owned this game and reviewed the Mac version back in 2010 right here at MyMac, http://www.mymac.com/2010/12/lego-star-wars/ I can say that the iOS version is both a great port, and supports the same level of detail that made the original so outstanding. However, the LEGO games have done a very decent, if not perfect, job of using the touch interface. There is the option to use tradition “virtual” control pad and buttons, or a newer, “follow my finger” control scheme. I personally enjoy the virtual controls better, but others prefer the newer controls. I like to have the options. For those of you unfamiliar with the LEGO style of gameplay, it’s pretty easy to pick up and play. The basics are break LEGO objects, pick up “coins,” and solve puzzles. While each LEGO game is different, they all follow this basic gaming premise. And by the popularity of the games, there is no doubt this is a winning formula. 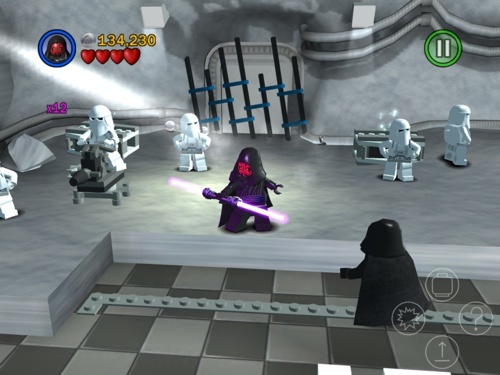 The iOS version of LEGO Star Wars: The Complete Saga is the same as you would find on the XBOX or PS3. Some iOS LEGO games are ports of other portable LEGO games, such as the two LEGO Harry Potter games, which are ports of the Nintendo DS version of the game. While the Nintendo DS games are fun, they are not as full featured as the console versions, and they “feel” like a portable game. Not so with LEGO Star Wars: The Complete Saga; it is the same version (with few exceptions) as the same one I own on both the PS3 and Mac. For instance, there is no way to unlock Indiana Jones in this version, where there is on the PS3. I rather liked playing as Indy in the Star Wars universe! But that is a minor quibble, as everything else is pretty much there. Some gamers are not happy that as a player, you can only buy the entire games as an in-app purchase. LEGO Star Wars: The Complete Saga gives you Episode 1 for free to play, and each of the other five episodes cost money. I personally just plunked down the $15 or so and unlocked it all as soon as I tried and confirmed the game was as fun as I knew it was. Again, I knew I loved this game from the other versions I have owned and played, but I was more curious if the touch controls would allow the game to play well. Fears adverted, I happily paid to unlock everything and began playing. While the controls do work well, I have found a few times that the touch controls were not accurate enough, and I have to switch to the “follow my finger” mode as I kept falling off cliffs or bridges, or the on-screen characters would not behave as I intended. Not enough to dissuade me from recommending the game, but enough to knock down slightly the overall rating I am giving this fun game. If you have never played this game, go download the game and give it a go. There is no fee to play episode 1, so what’s the risk? For me, it was totally worth unlocking everything and having hours of fun, reliving one of my all time favorite video games. Fun, exciting, humorous, and great graphics and game play. You can beat that! MyMac.com Rating: 9 out of 10.
iOS, LEGO, Lego Star Wars: The Complete Saga, Star Wars, Warner Bros. The LEGO games for iOS have been great and this is no exception. A lot of people are complaining in the reviews about the $9.99 unlock price, but what they don’t realize is that this is two games in one. Other LEGO games are $4.99, but this is the first trilogy and the second trilogy. $9.99 is definitely reasonable.